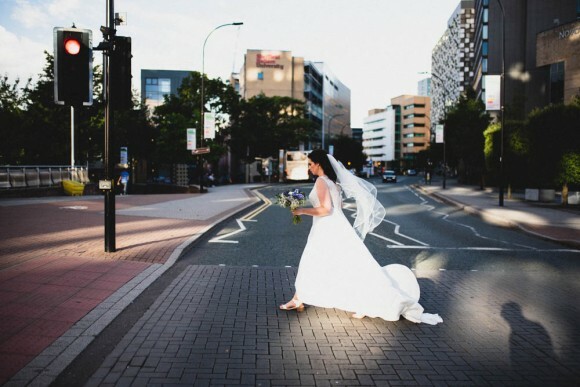 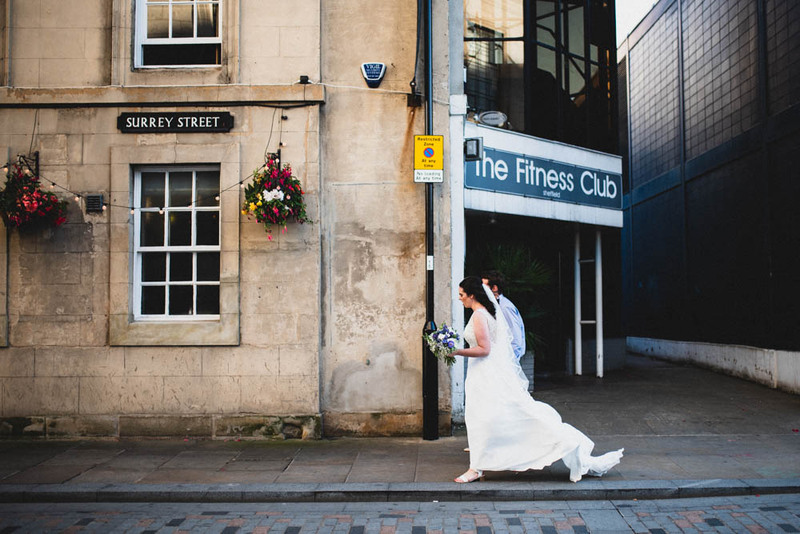 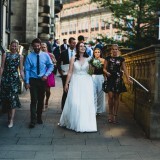 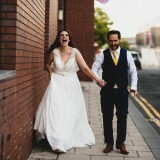 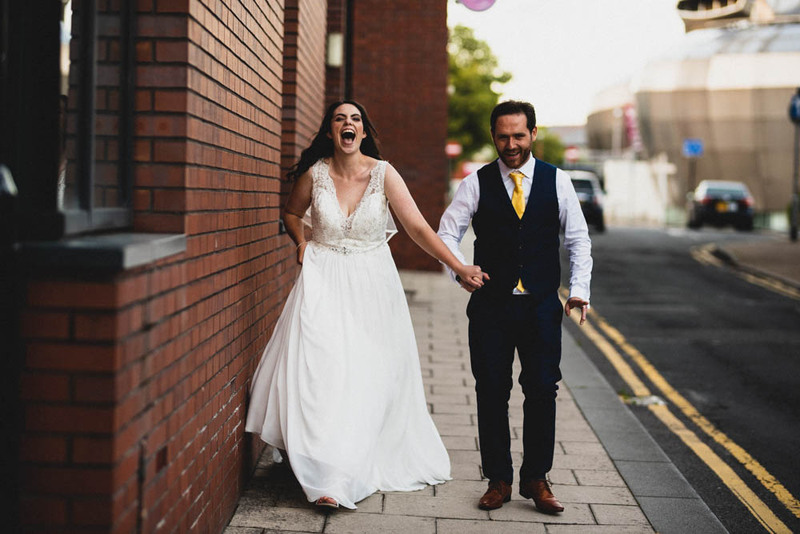 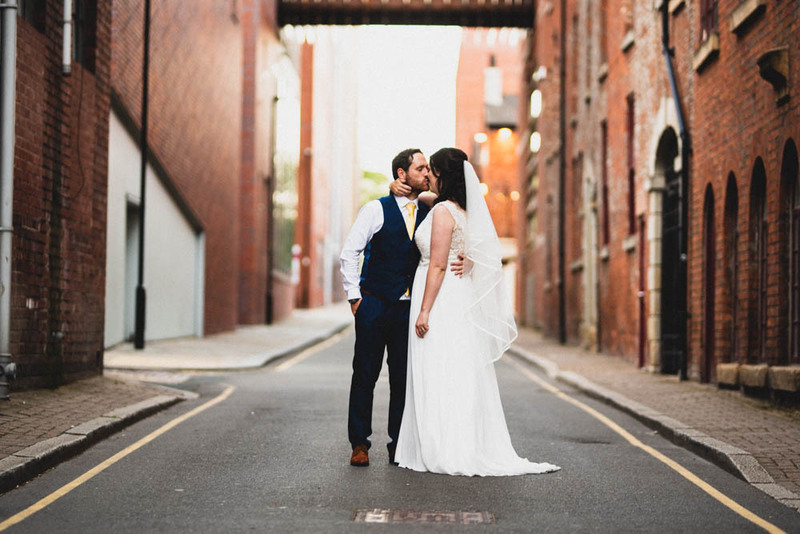 Today’s real wedding is city chic at its best, as we escape to Sheffield for an informal, relaxed wedding in the midst of this summer’s heatwave. 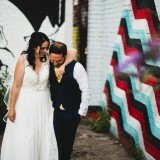 Prepare for lots of hidden backstreet shots and colourful graffiti for something unconventional and truly memorable! 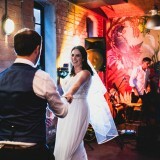 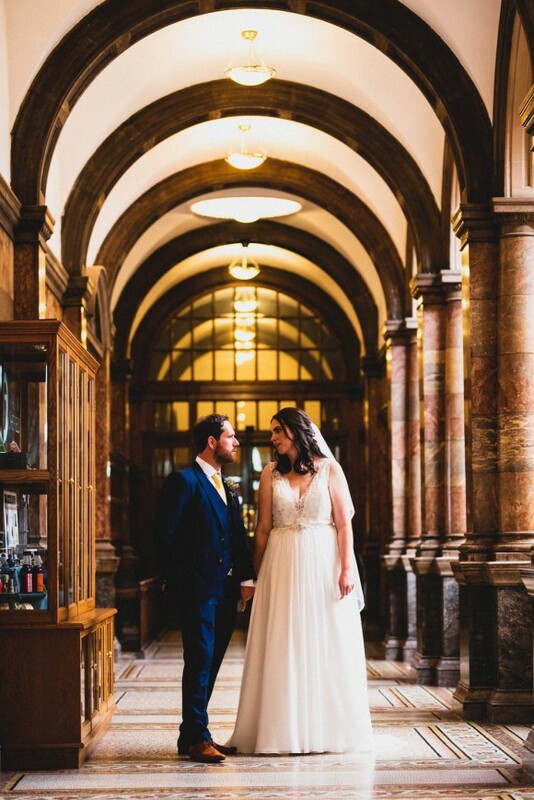 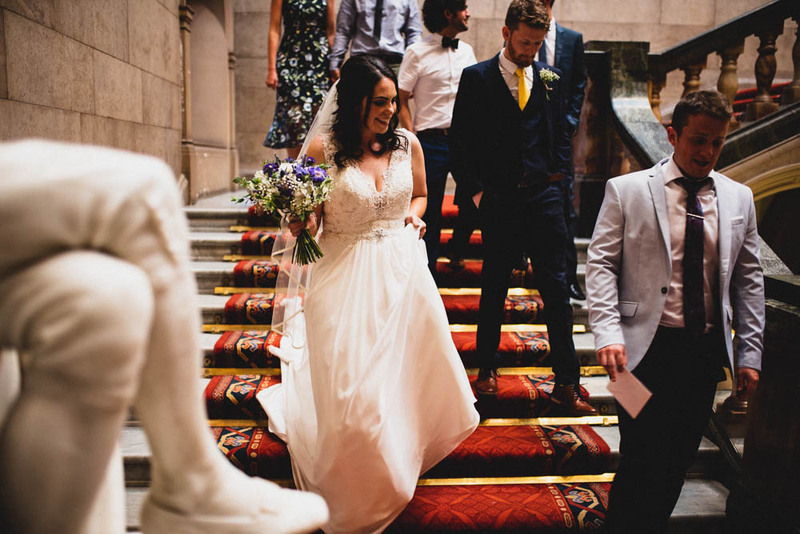 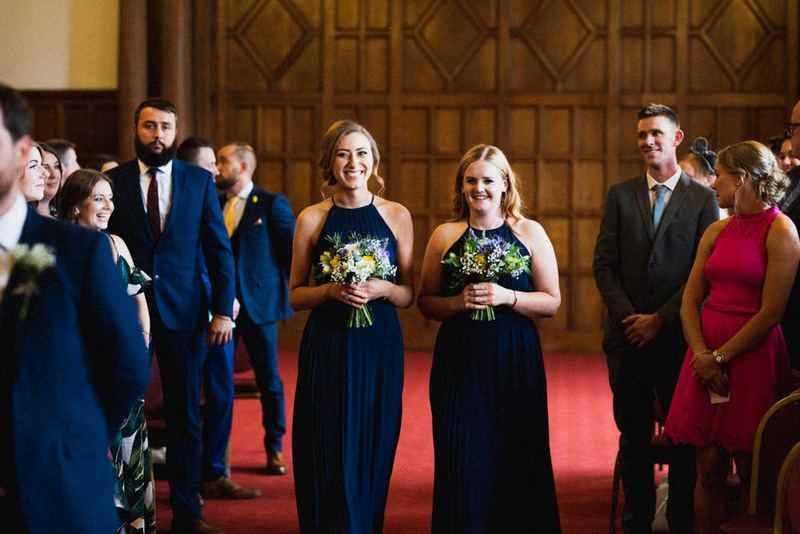 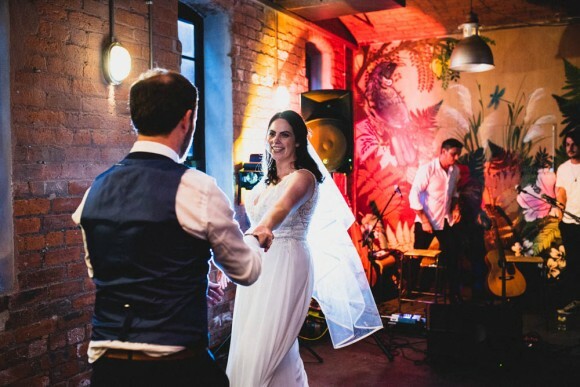 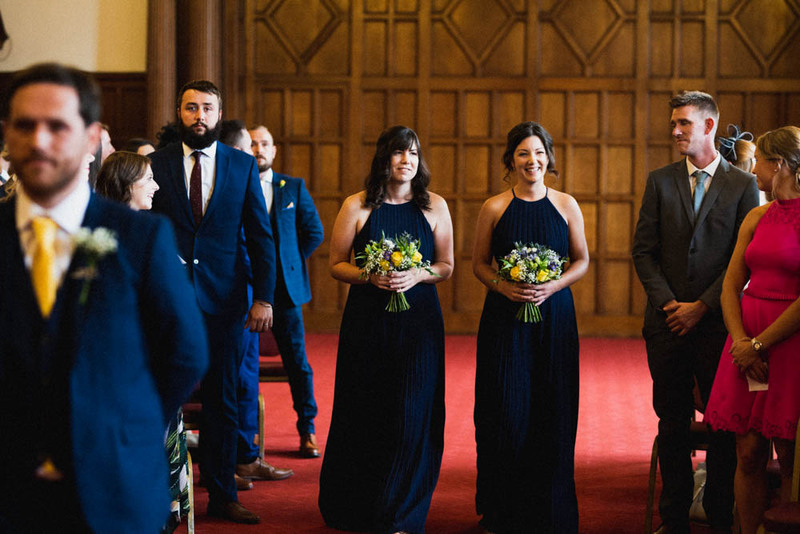 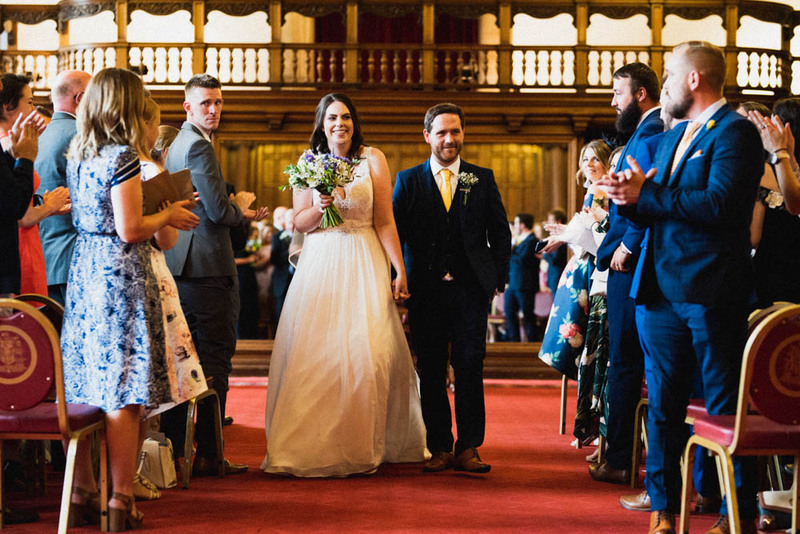 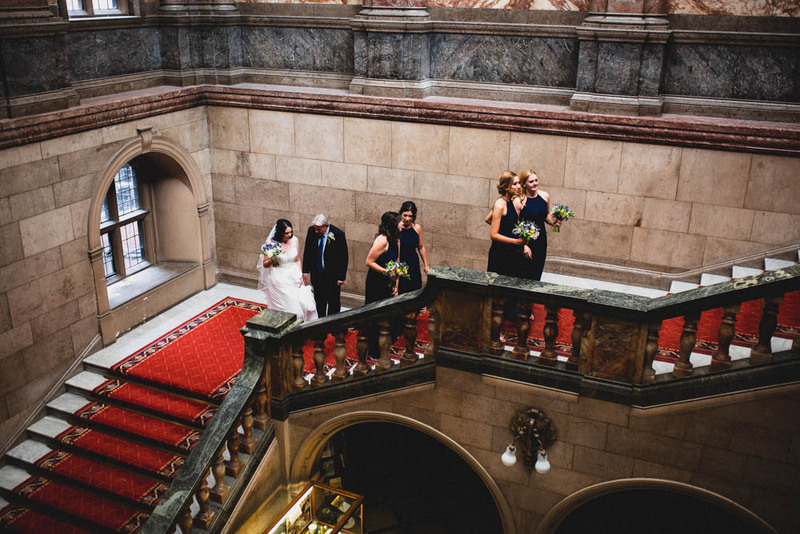 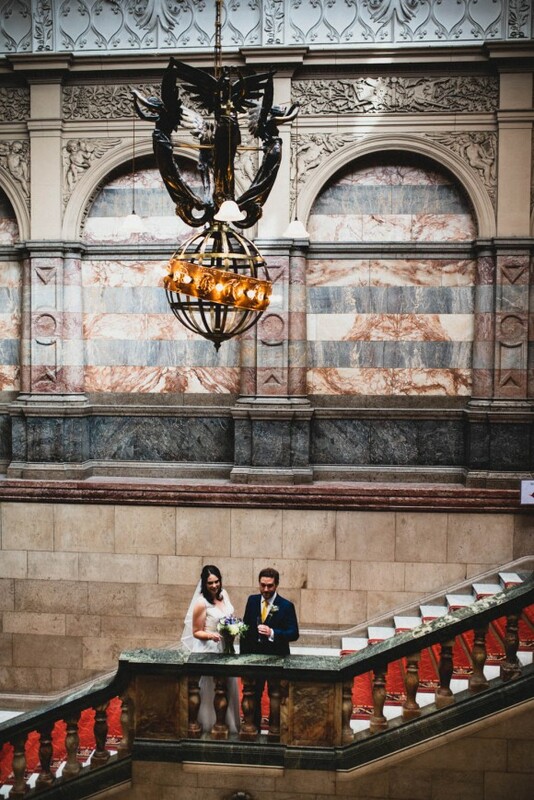 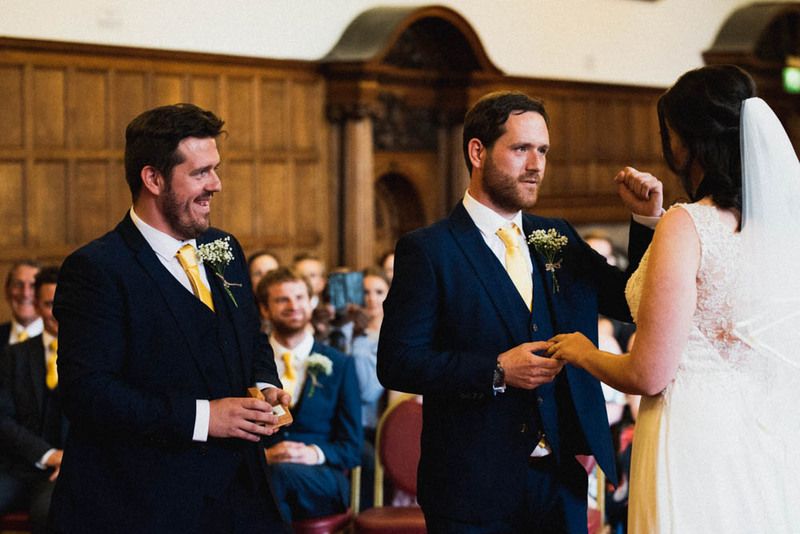 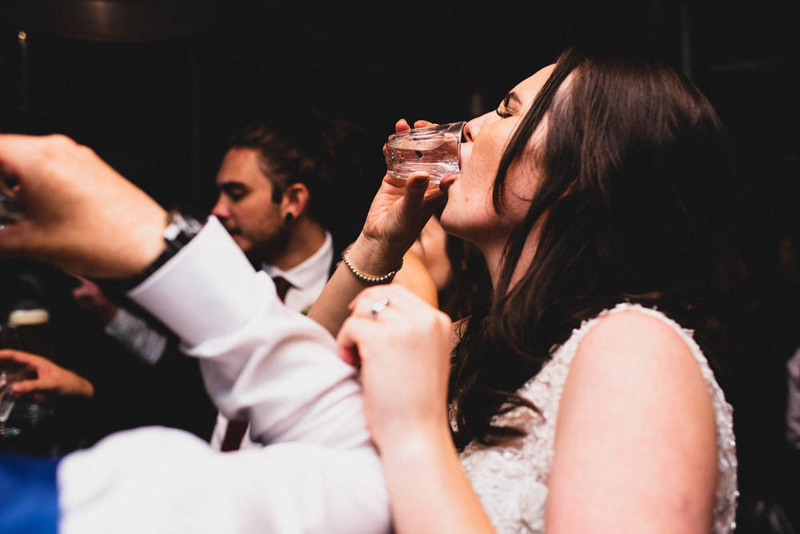 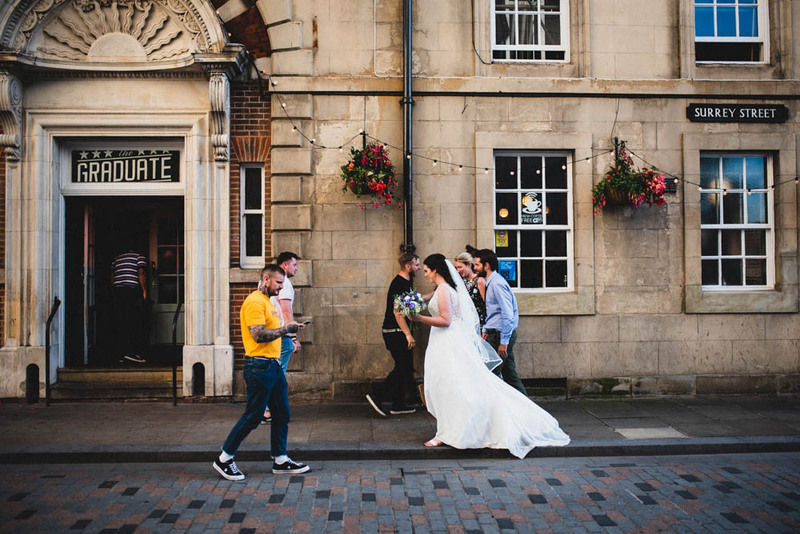 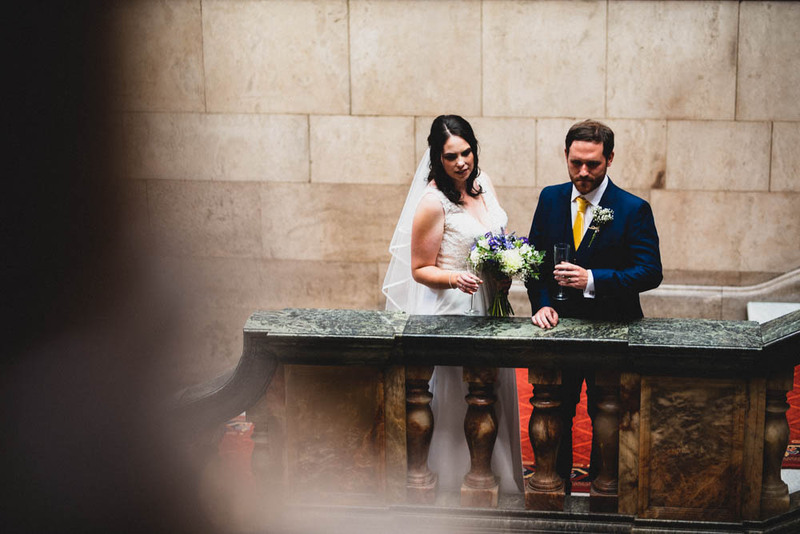 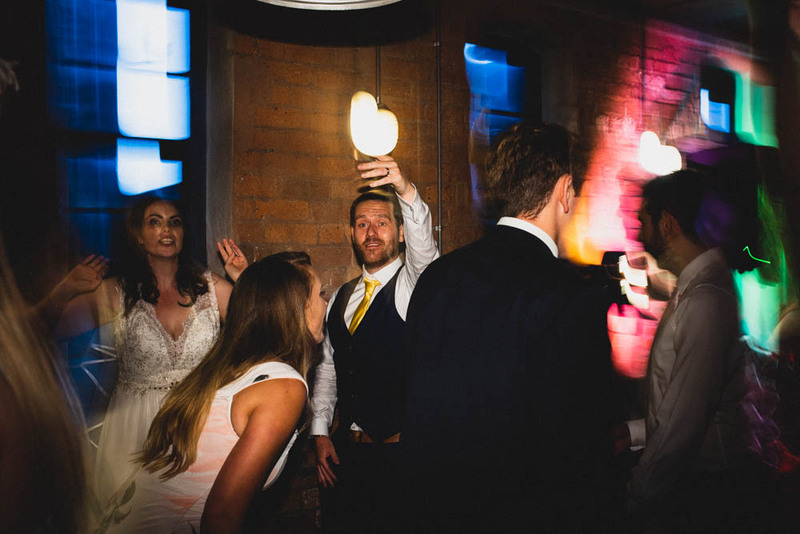 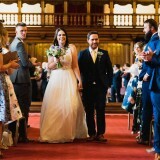 Holly and James tied the knot at the impressive Sheffield Town Hall in July before celebrating with friends at the uber cool Tamper Coffee. 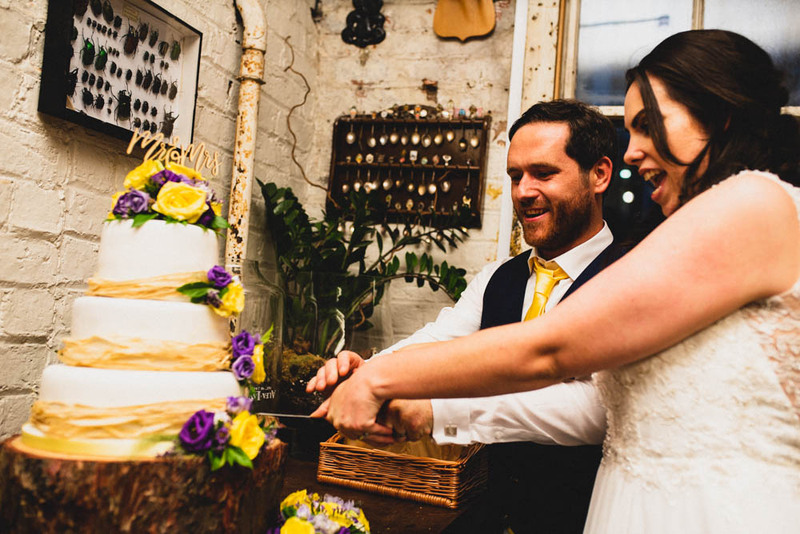 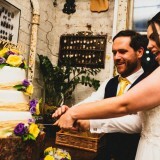 Yep, coffee lovers, you read that right – a coffee shop, inspired by New Zealand’s café culture no less, provides the endearing backdrop to our featured wedding today. 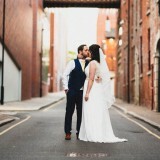 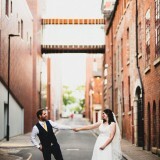 And it’s giving us a heady dose of urban wedding day envy! 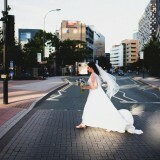 With images by JLM Wedding Photography. 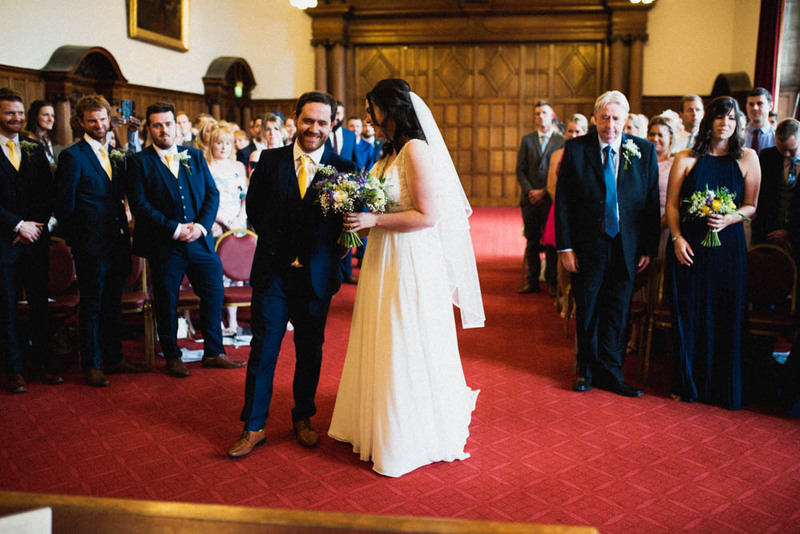 holly says: We got engaged on 3rd June 2017 in Bramhall Park. 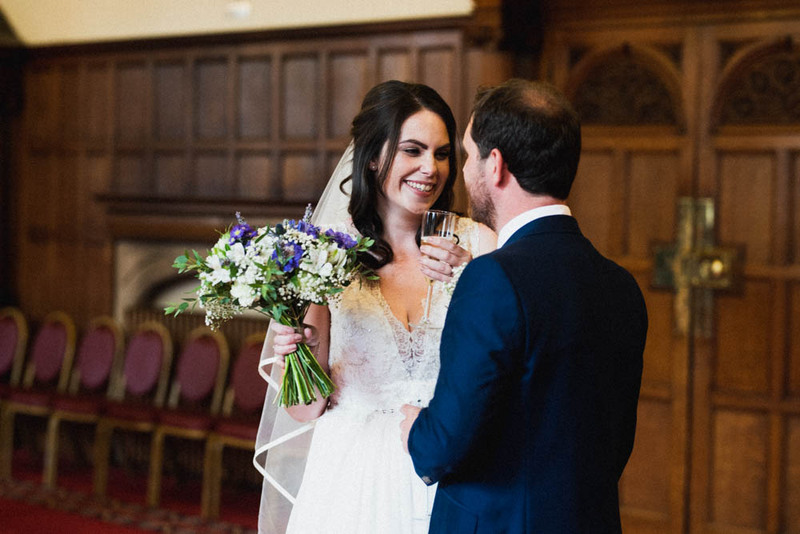 James had wanted to go to visit Bramhall Hall for months, so we went for a picnic and he surprised me by asking me to marry him. 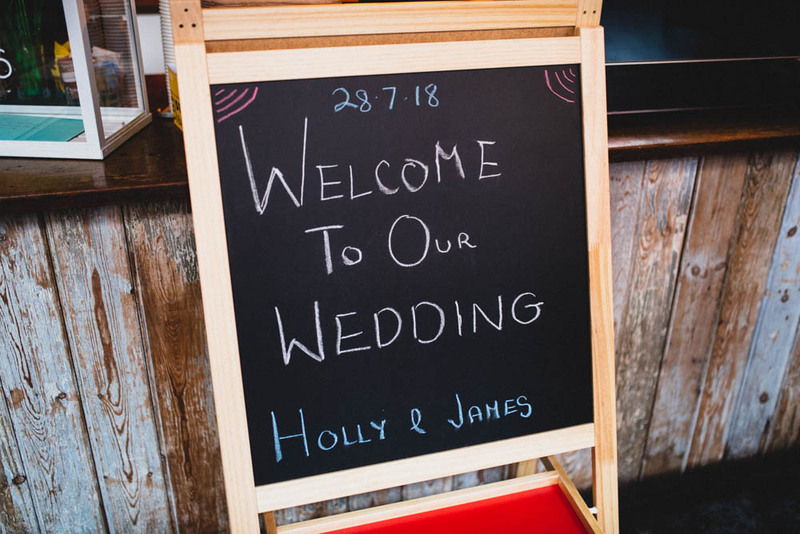 We got married on 28th July 2018 – James is a teacher so we wanted to get married in the summer holidays so we could go straight on our honeymoon. 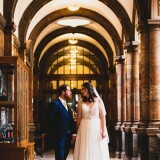 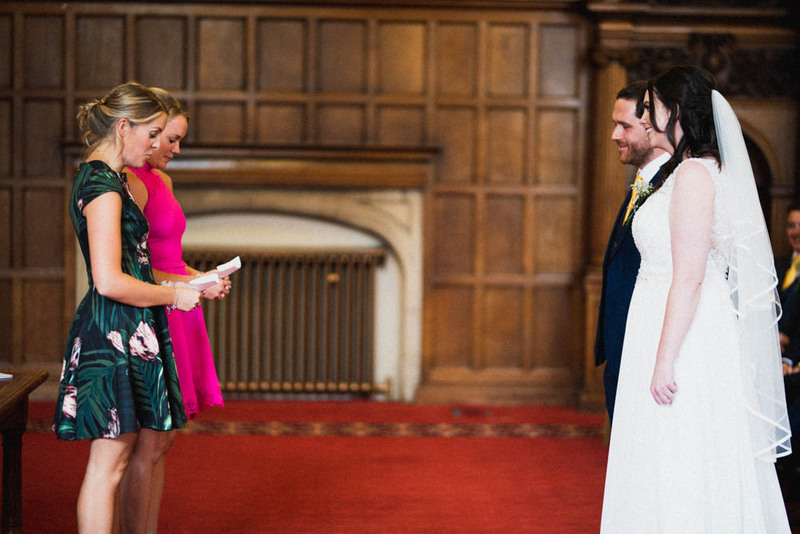 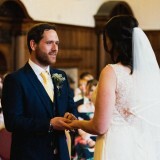 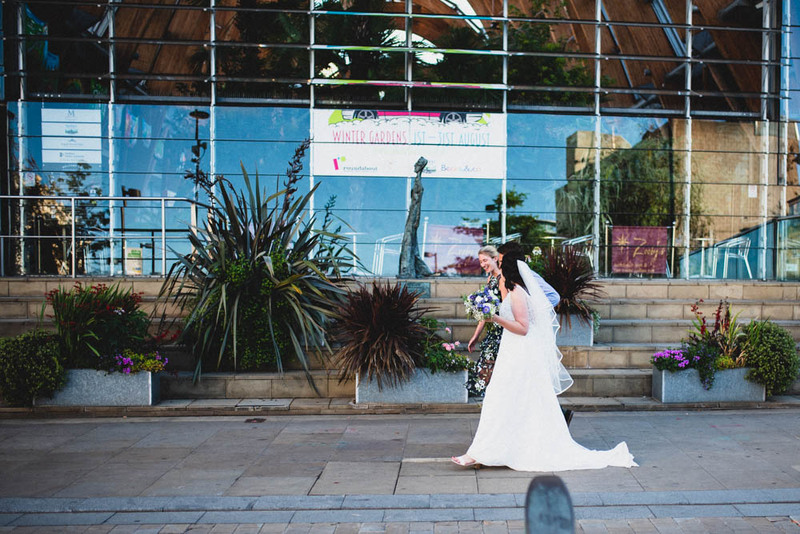 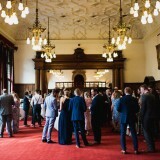 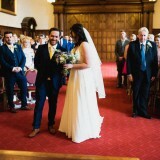 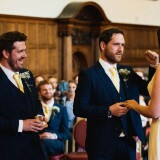 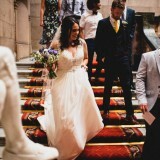 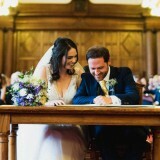 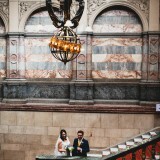 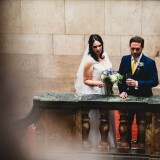 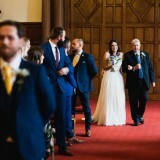 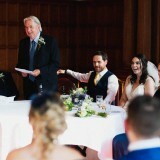 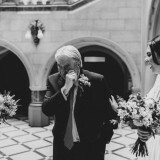 Our ceremony was in the Ceremony Rooms at Sheffield Town Hall and our reception venue was Tamper Coffee. 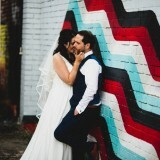 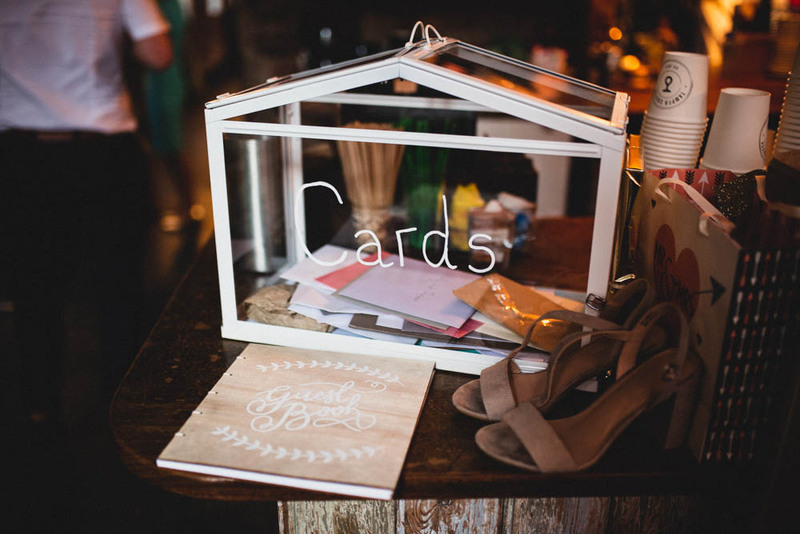 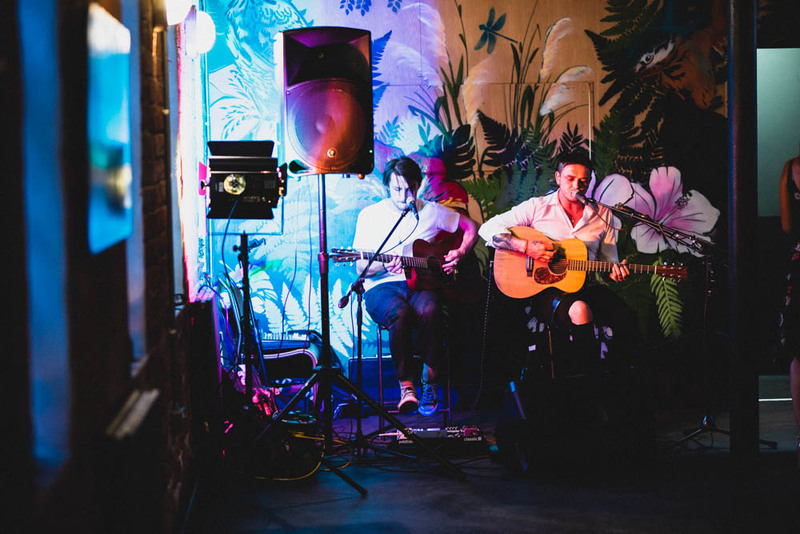 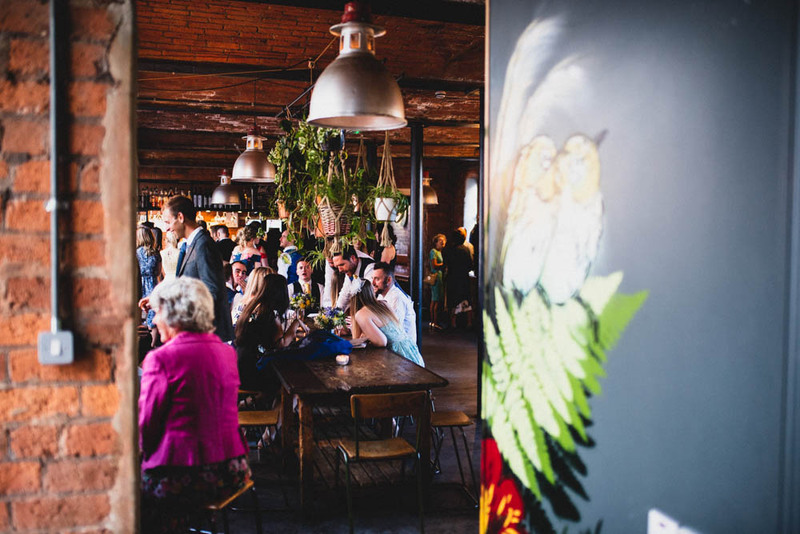 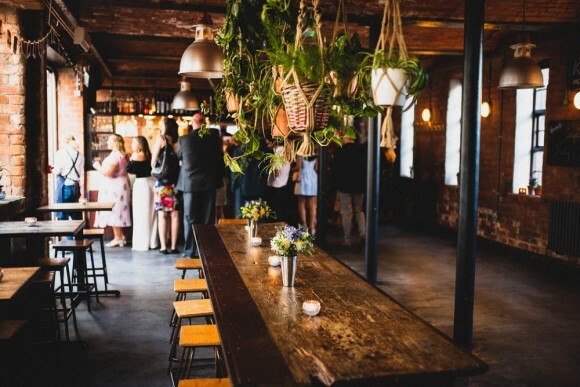 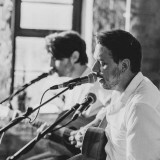 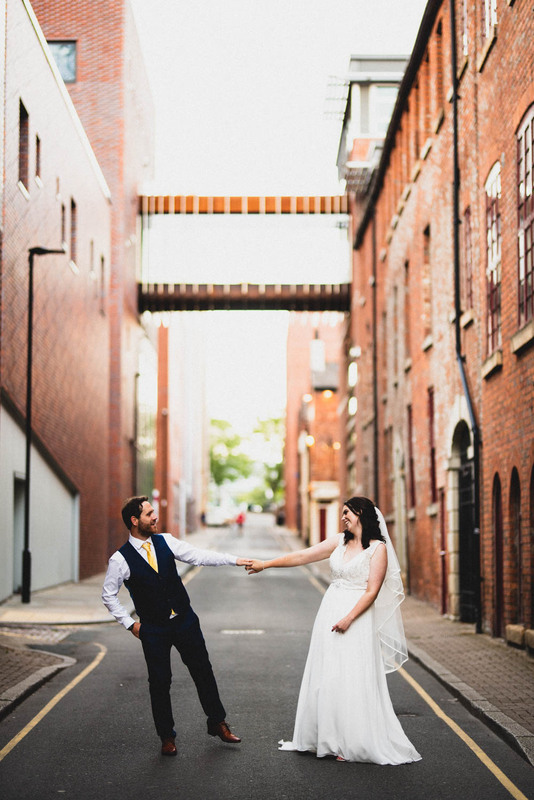 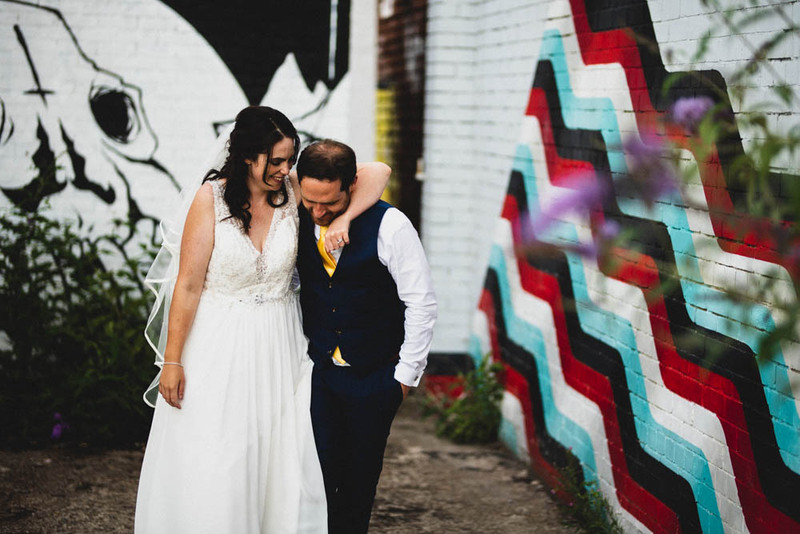 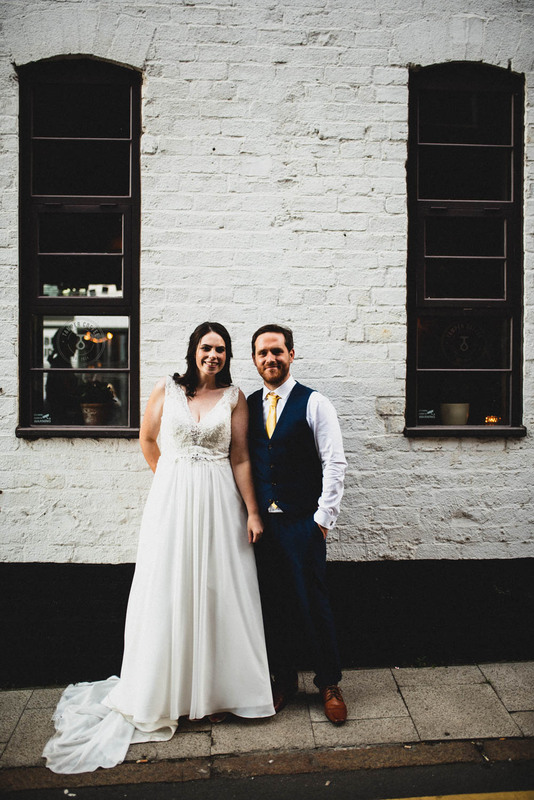 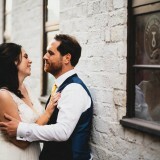 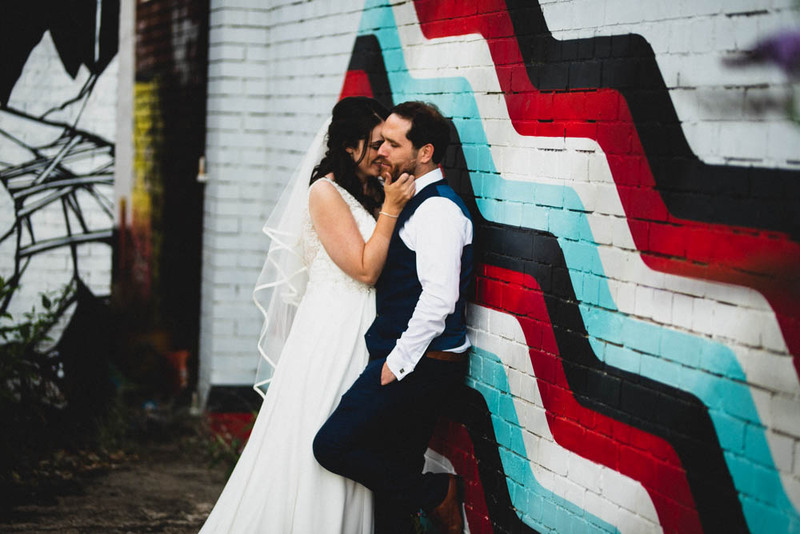 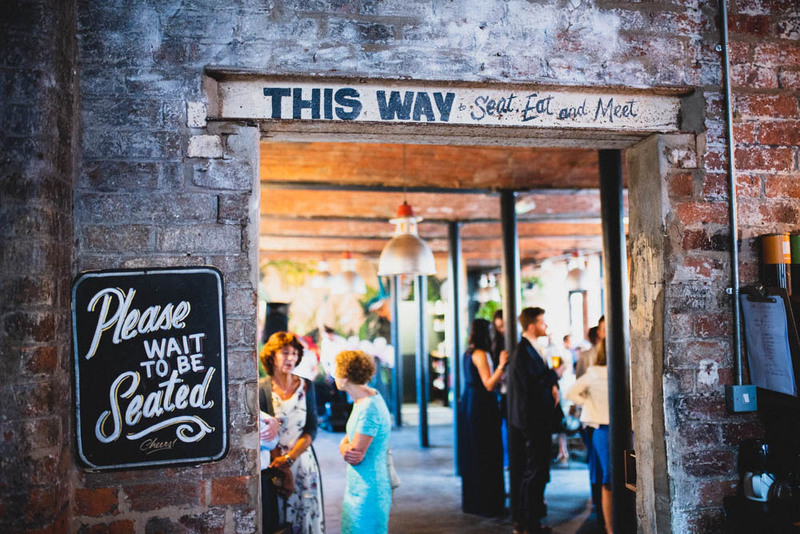 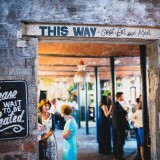 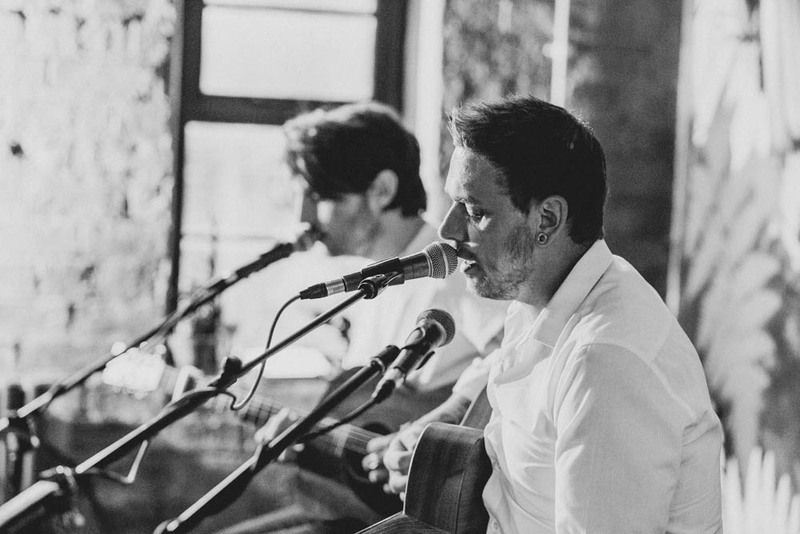 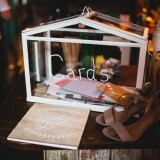 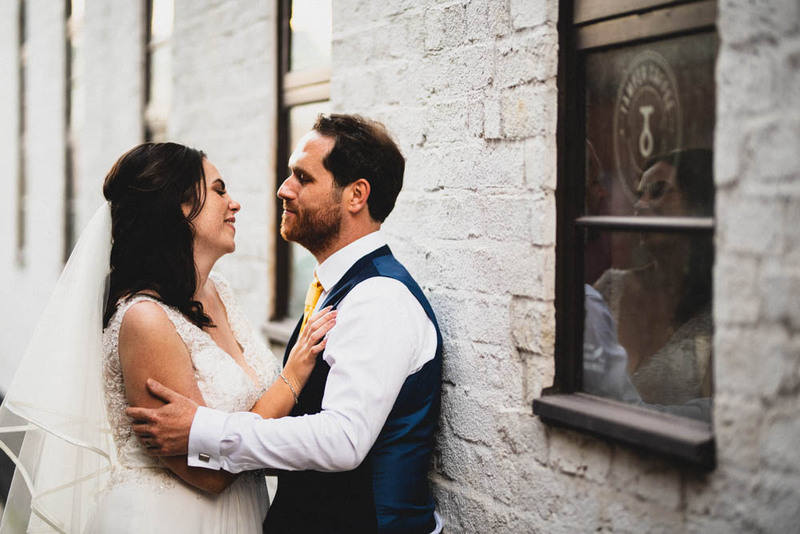 We wanted a laidback informal day with venues close to each other and these two were perfect. 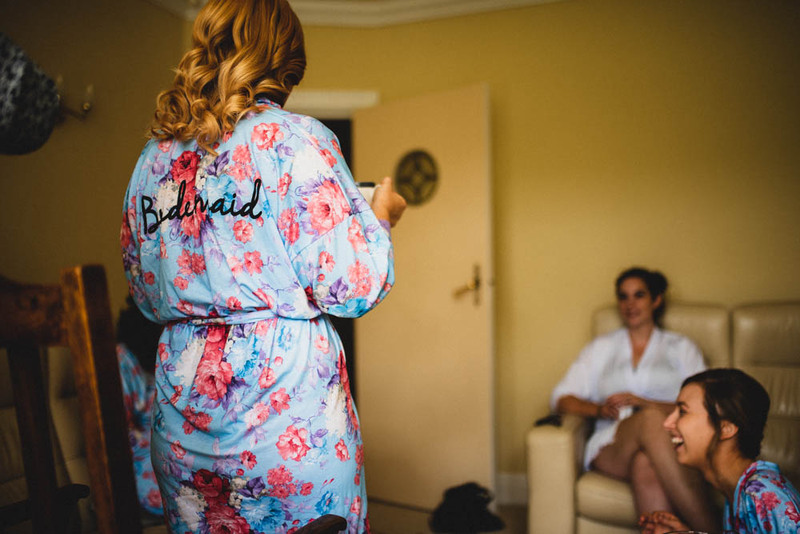 We didn’t really have a theme, we just knew we wanted a low-key relaxed day. 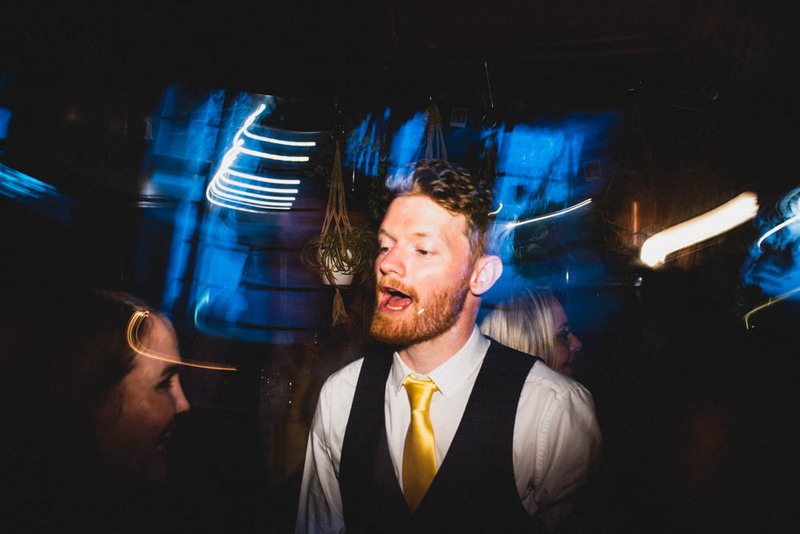 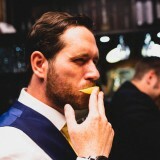 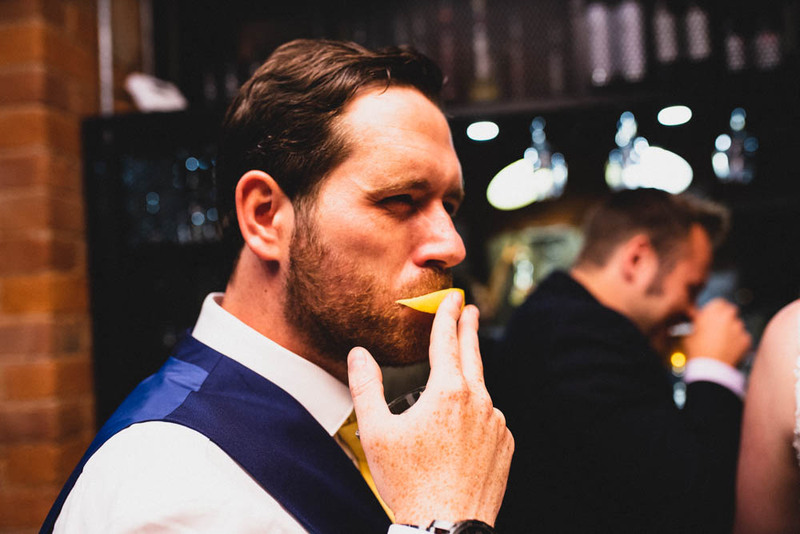 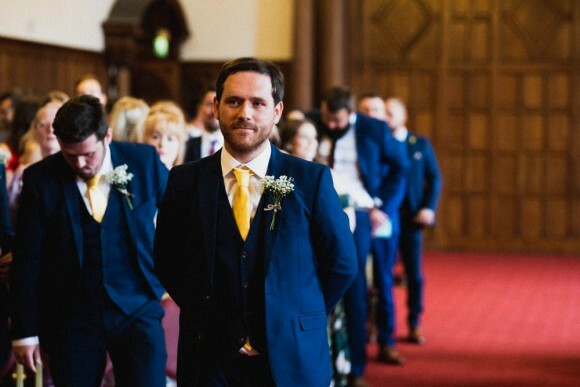 We went for navy, white and yellow colour scheme – largely because we felt they looked good, but James will tell you it is because they are the colours of Leeds United! 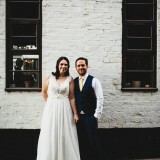 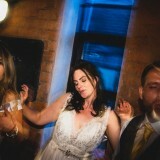 My dress was by Amanda Wyatt from Once Upon a Bride in Hyde. 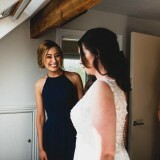 I went in with one idea of the dress I wanted but when I tried my dress on, I couldn’t stop smiling so knew it was the right choice! 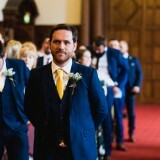 James wore a navy three-piece suit from Slaters. 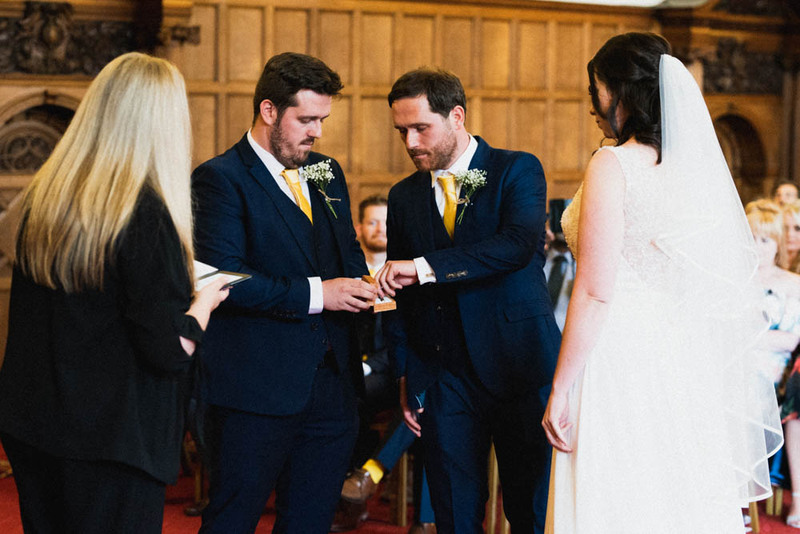 The groomsmen wore their own navy suits and they had matching yellow socks and ties. 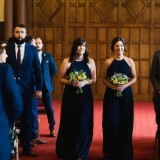 My bridesmaids, meanwhile, wore navy dresses from ASOS. 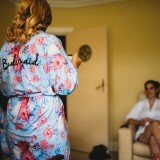 We had our hair and makeup done by Saskia from Beau Hair and Make Up. 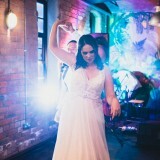 She was amazing and so professional. 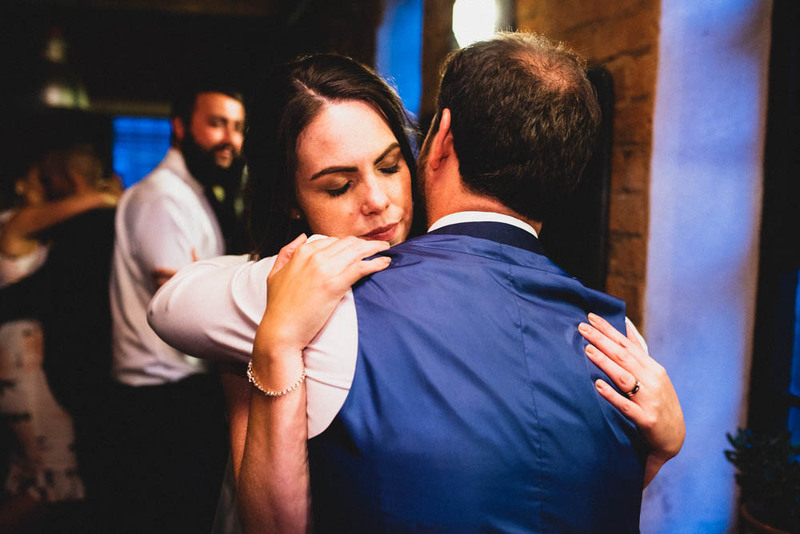 My best friend’s parents drove us to the venue. 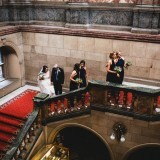 The boys were already in the city centre so walked to the Town Hall. 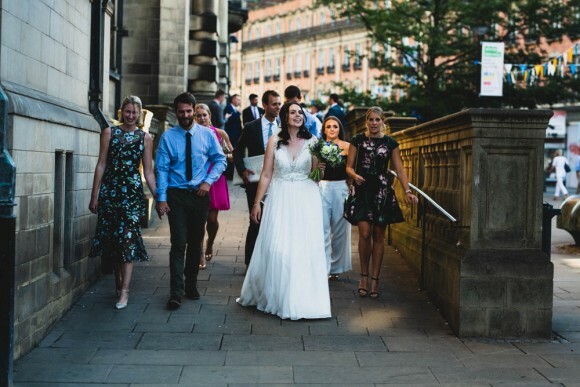 We then all walked together from the Town Hall to Tamper. 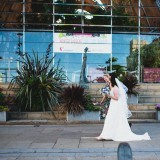 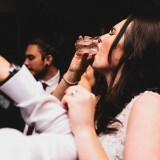 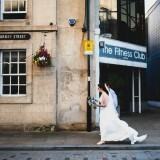 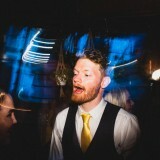 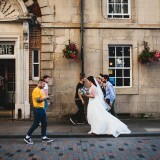 Our photographer was James from JLM Wedding Photography. 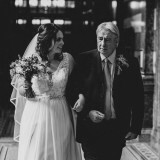 He was fantastic – from first getting in contact through to getting our photos, his service was first class. 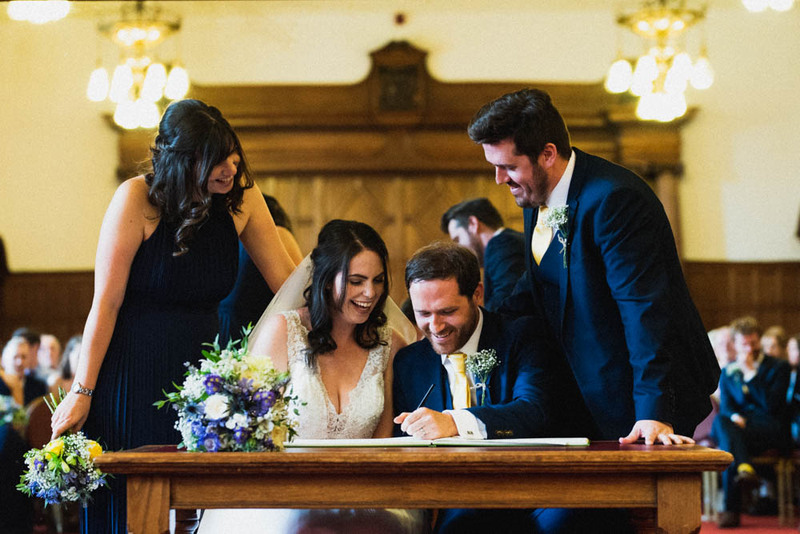 James made a slideshow of our photos, which was a lovely touch and a nice way to share a selection of our photos with friends and family. 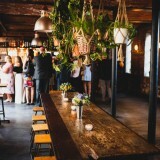 Our flowers were provided by Liz from Meadowsweet Flowers. 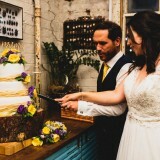 I had no idea of the flowers I wanted, so gave Liz our colour scheme and free reign, and the bouquets she made were beautiful. 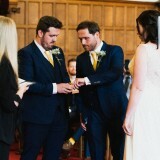 The boys had gypsophila button holes too. 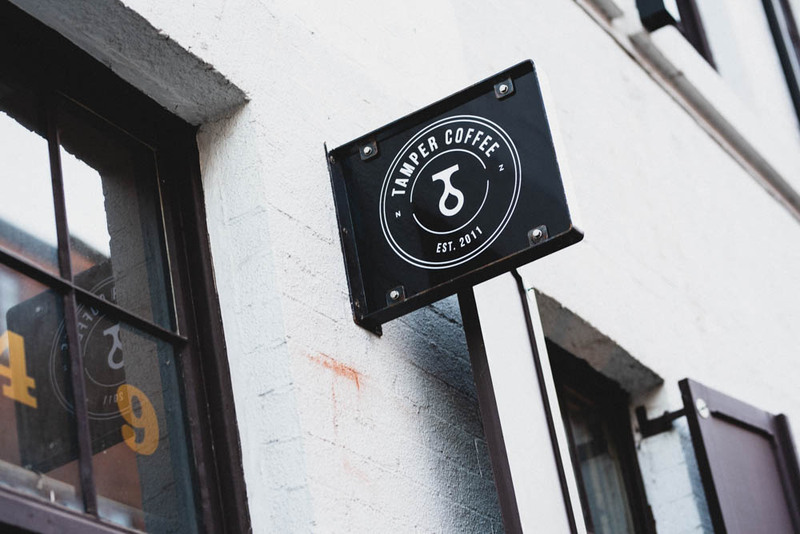 Tamper has such great décor already so we decorated it with simple strings of Polaroid style photographs which we made ourselves. 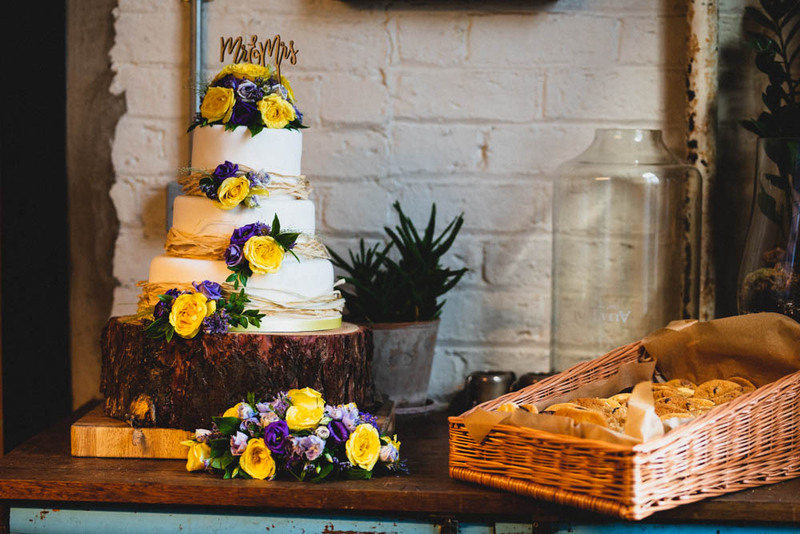 My best friend’s mum made our cake as a gift; it tasted great and got so many compliments. 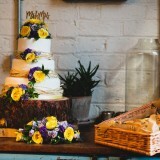 It was three tiers – Victoria sponge, carrot and fruit cake. 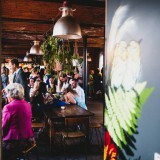 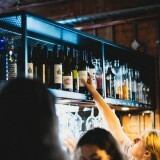 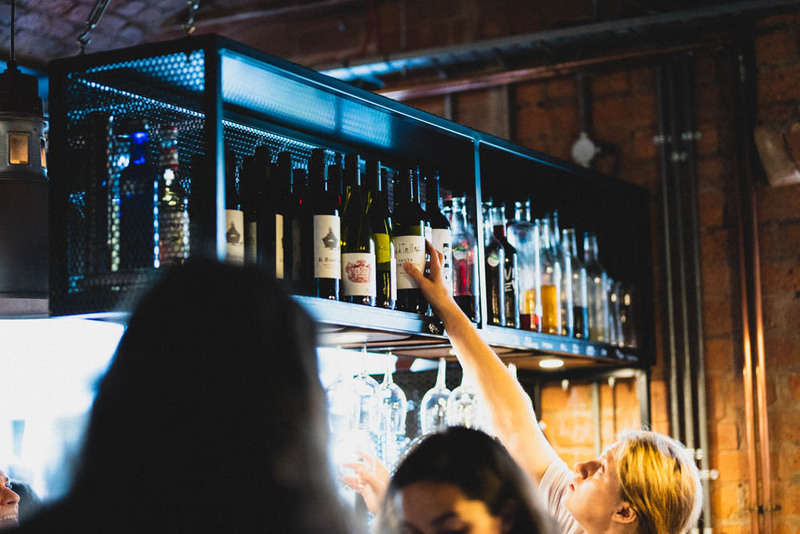 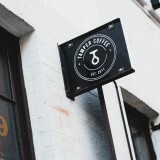 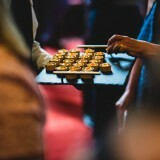 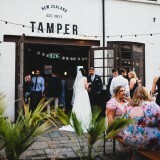 The food at Tamper was great and our guests were raving about it. 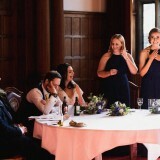 We ate vegetarian chilli, pork with noodles, potato wedges and salad. 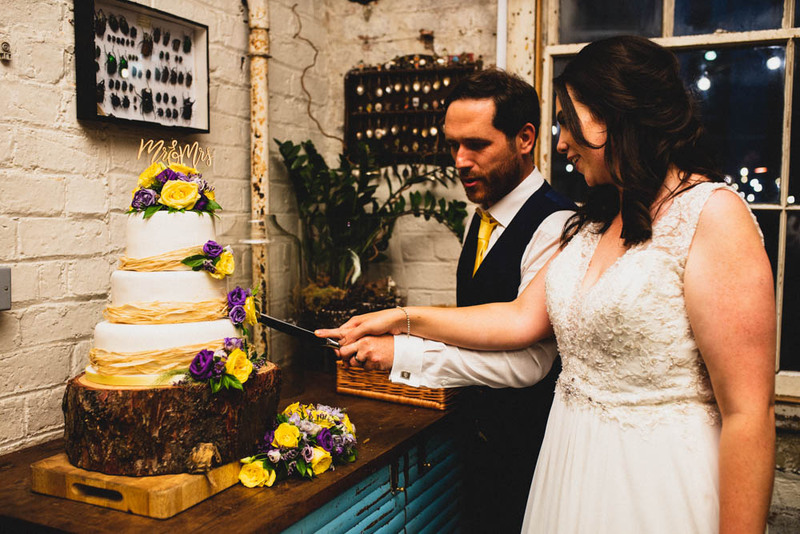 For pudding we had cookies and, of course, our wedding cake. 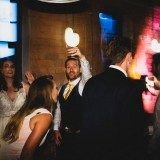 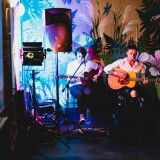 Tamper is quite a small venue so we decided on Leon Pashley for our entertainment, who sang and DJ’d at our evening reception – he was excellent. 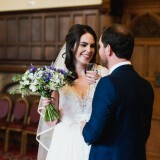 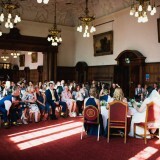 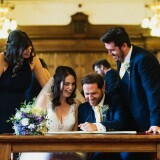 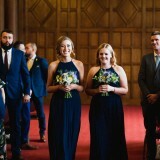 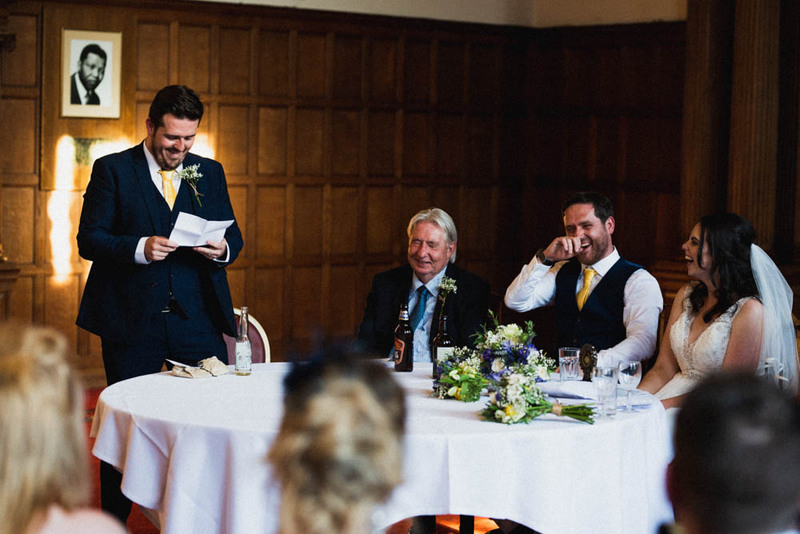 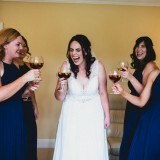 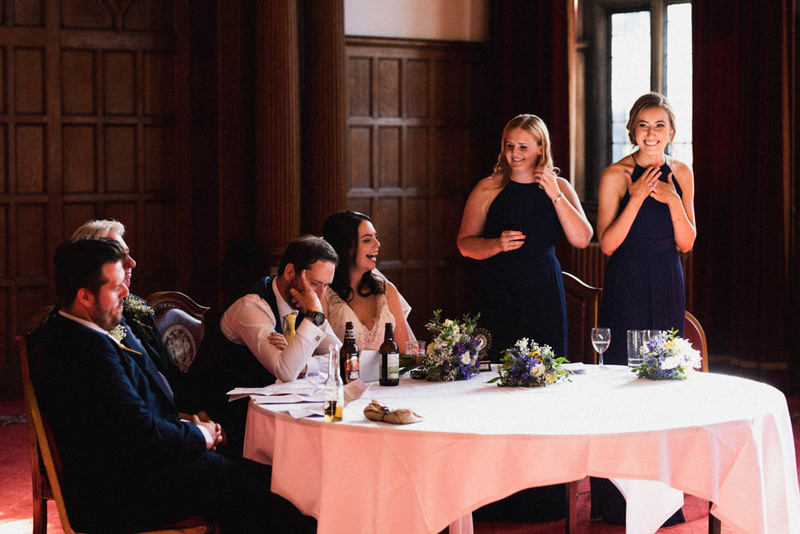 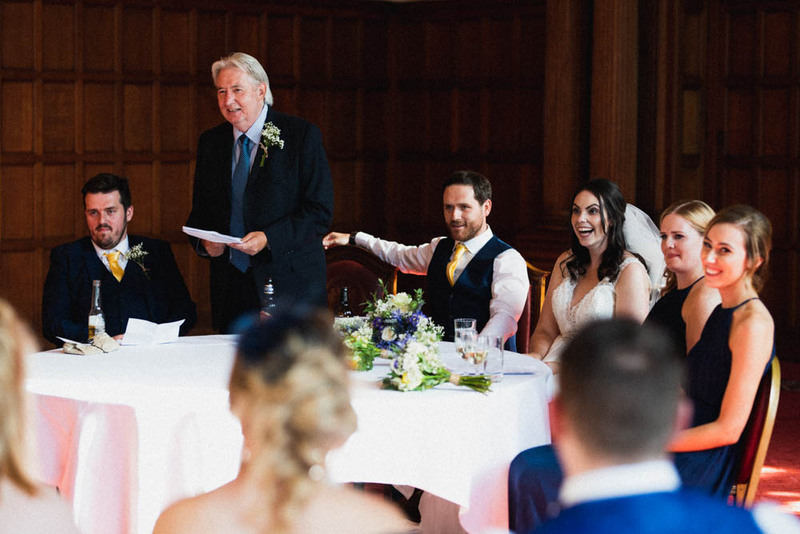 As we didn’t have a sit-down wedding breakfast, we had our speeches in the Town Hall, which added a relaxed feel and we broke tradition with two of my bridesmaids also making a speech. 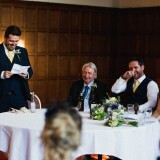 Two good friends did a reading as part of the ceremony too, which was so special and had me welling up. 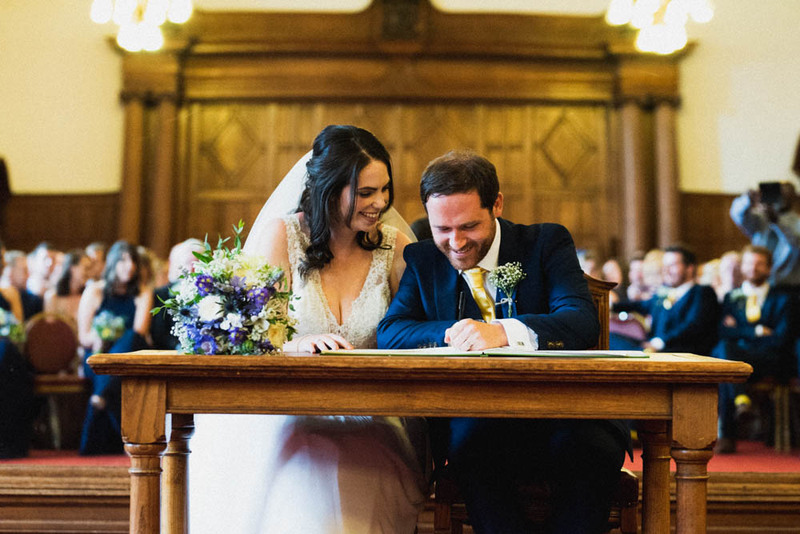 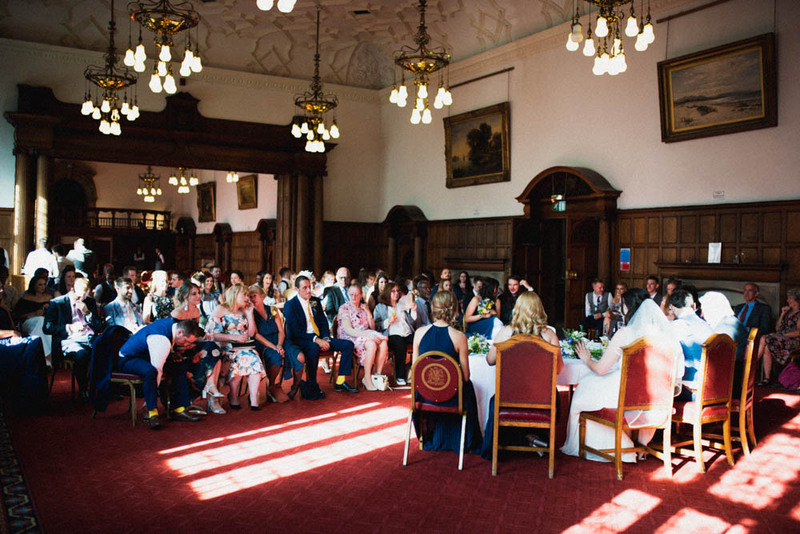 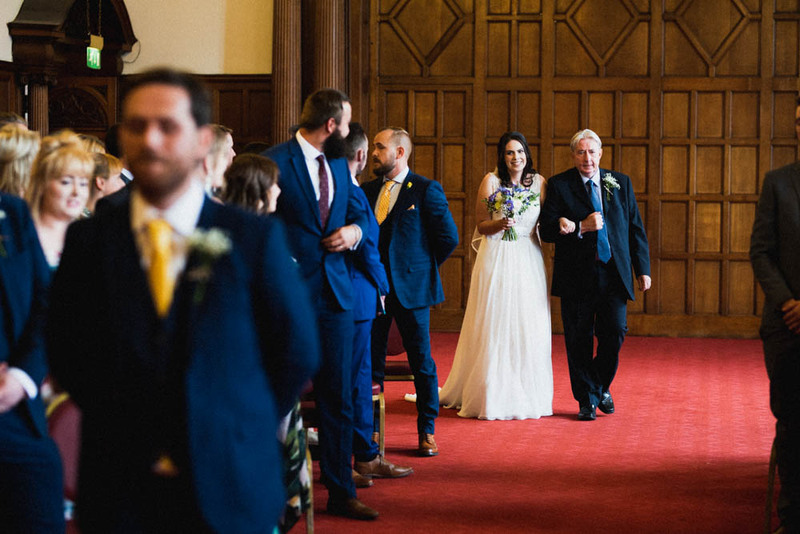 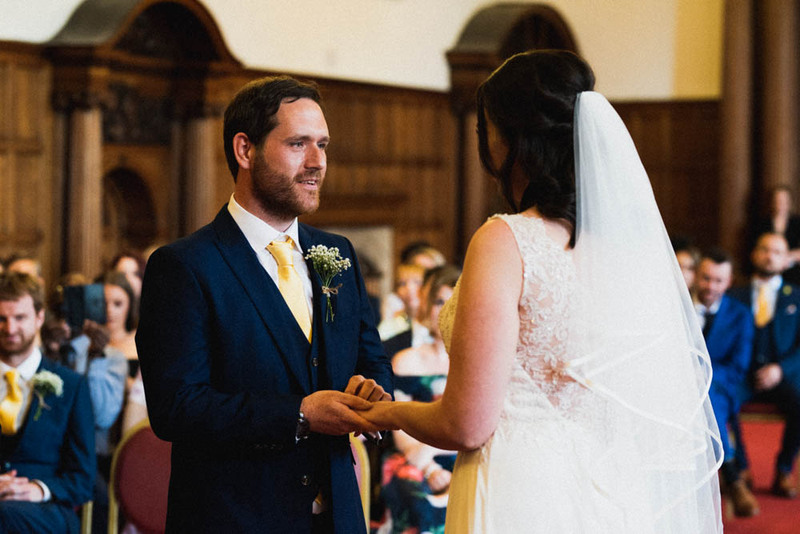 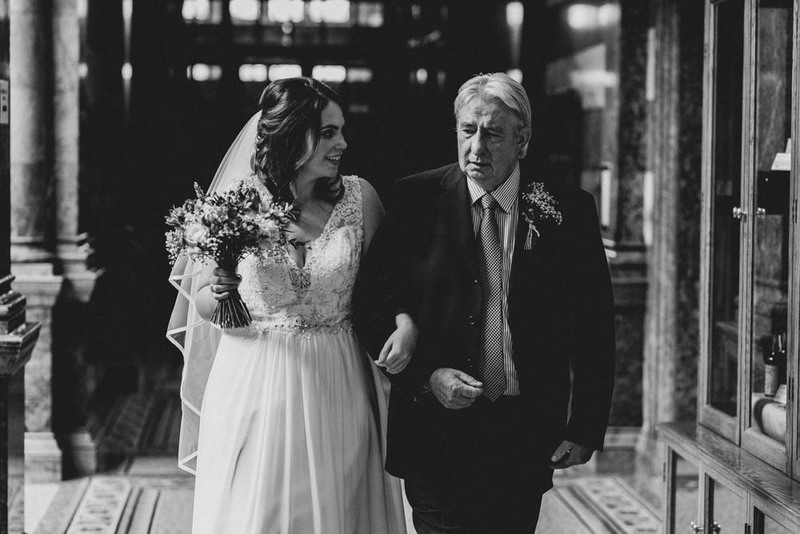 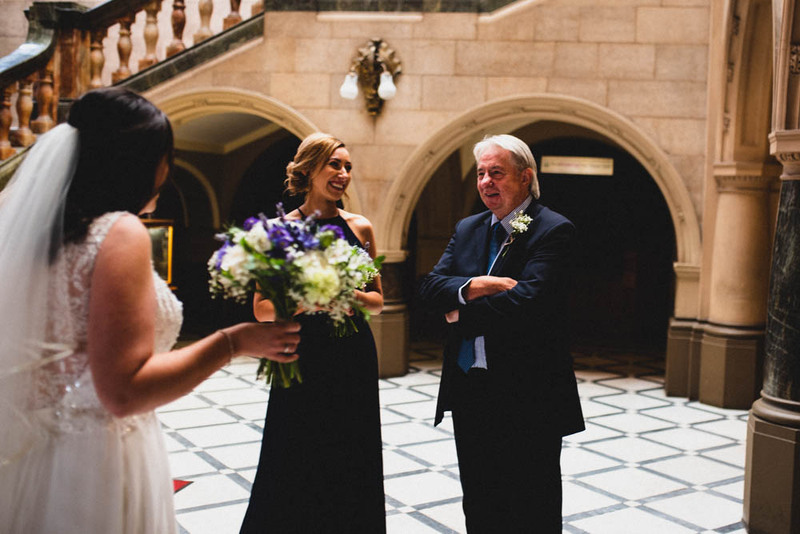 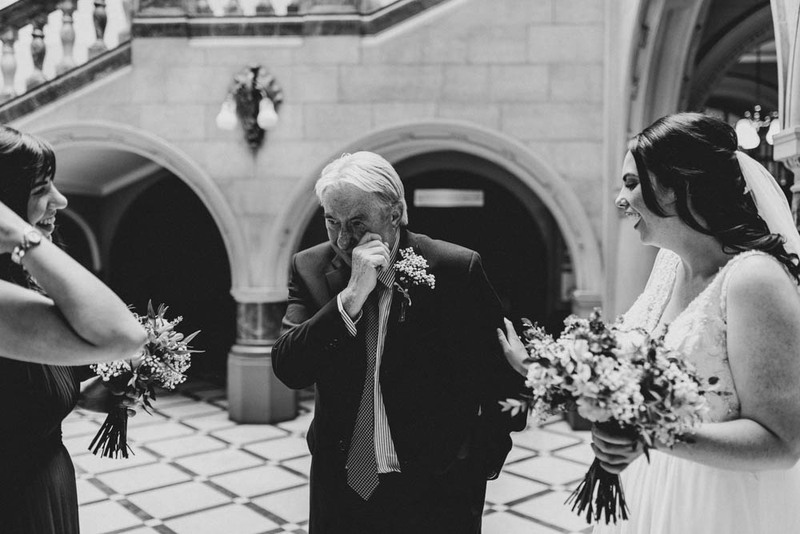 Following our big day, we would recommend both our chosen venues to other brides and grooms – the Ceremony Rooms at the town hall are stunning and such a special place to get married. 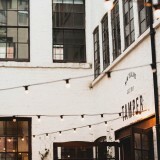 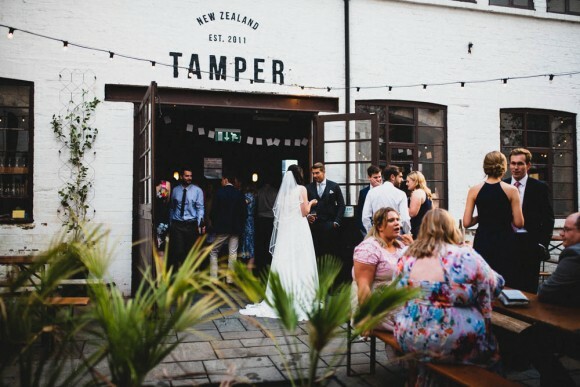 Tamper Coffee is a great venue for a casual evening reception, it has a great outside space and the staff were fantastic. 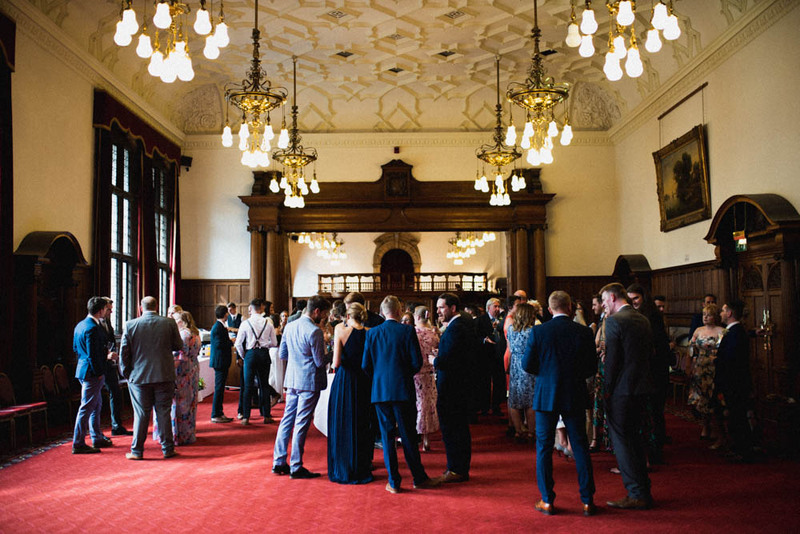 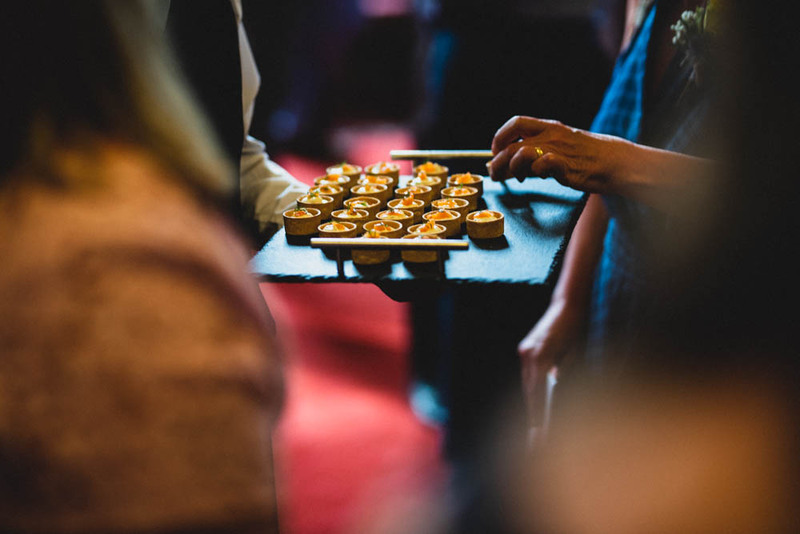 If we had to choose a favourite part of the day it would have to be the drinks reception – seeing and speaking to all our friends and family in one room was a very special moment. 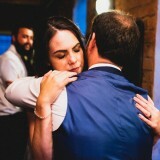 After the wedding, we had two weeks in Greece for our honeymoon; initially on mainland Greece then island hopping, eating amazing food, drinking wine and sightseeing. 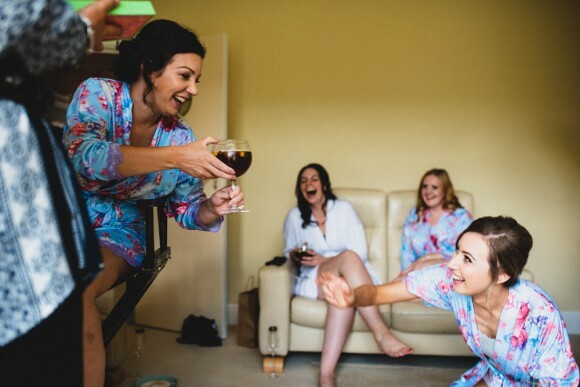 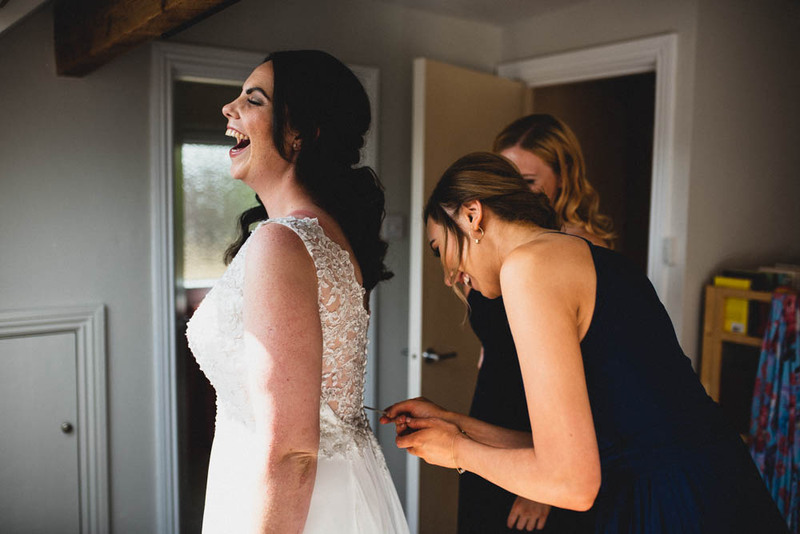 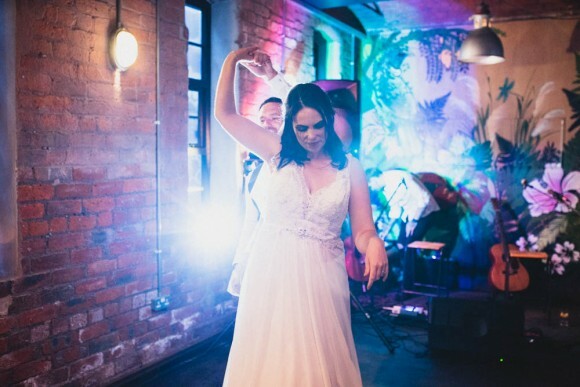 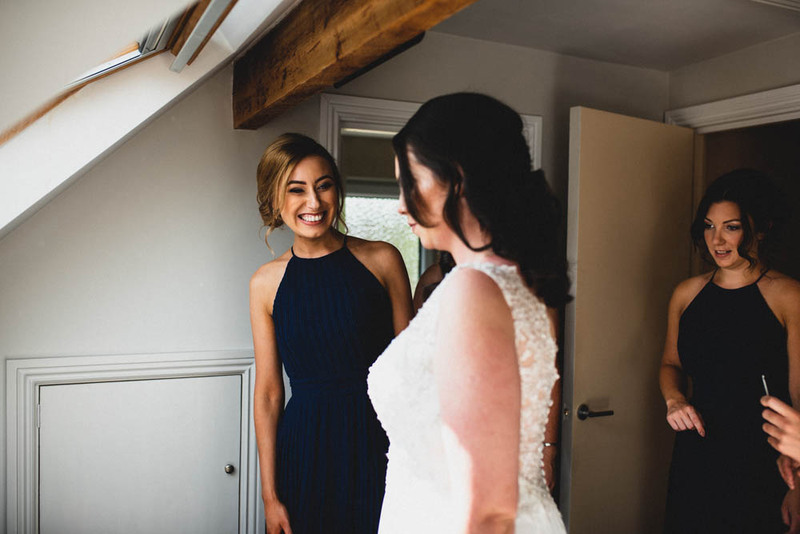 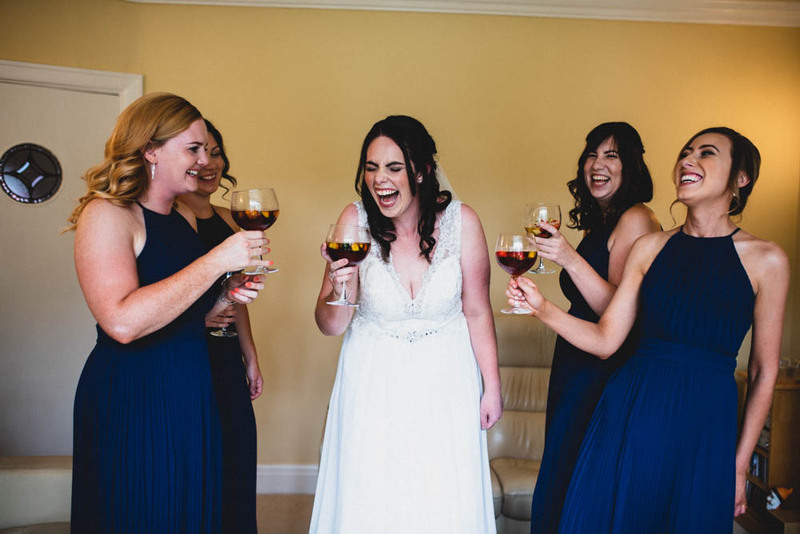 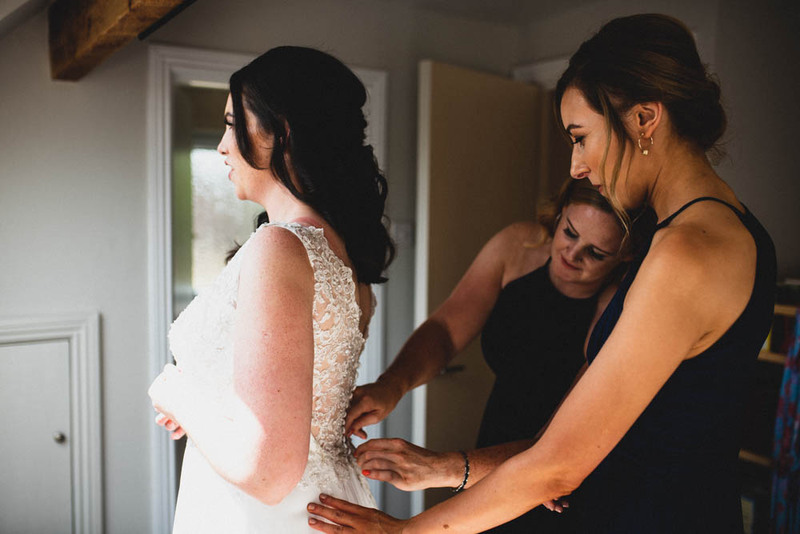 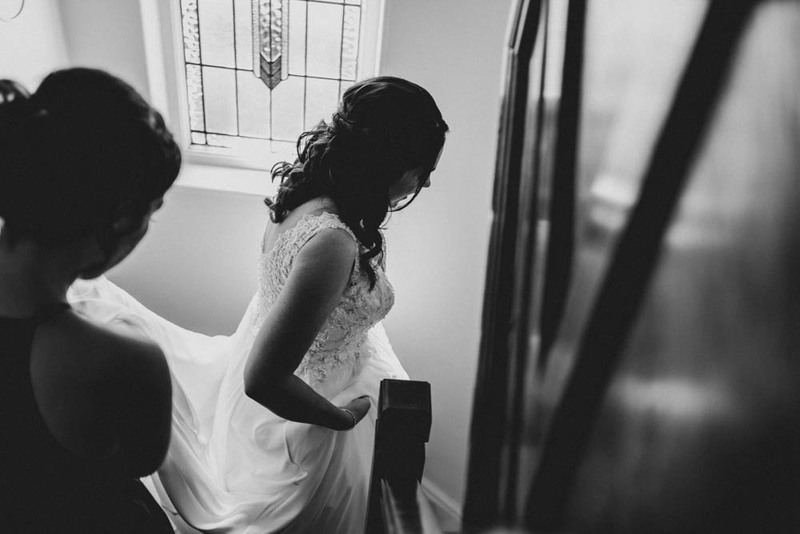 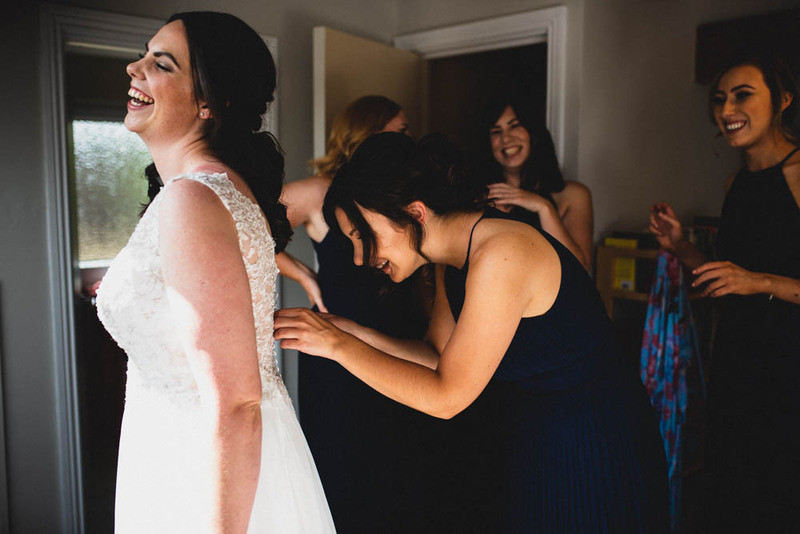 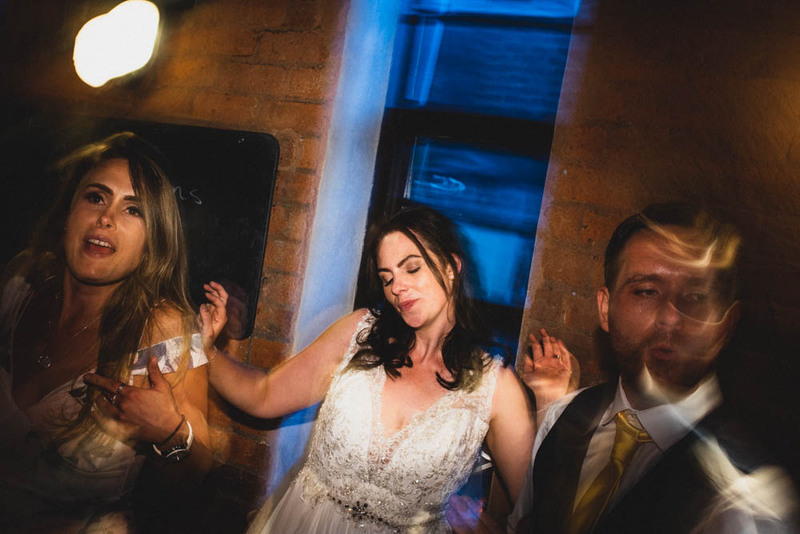 My top tip for other Brides Up North would be, do exactly what you want to do on your day – just because it doesn’t fit the ‘regular mould’ of a wedding day doesn’t make it any less special. 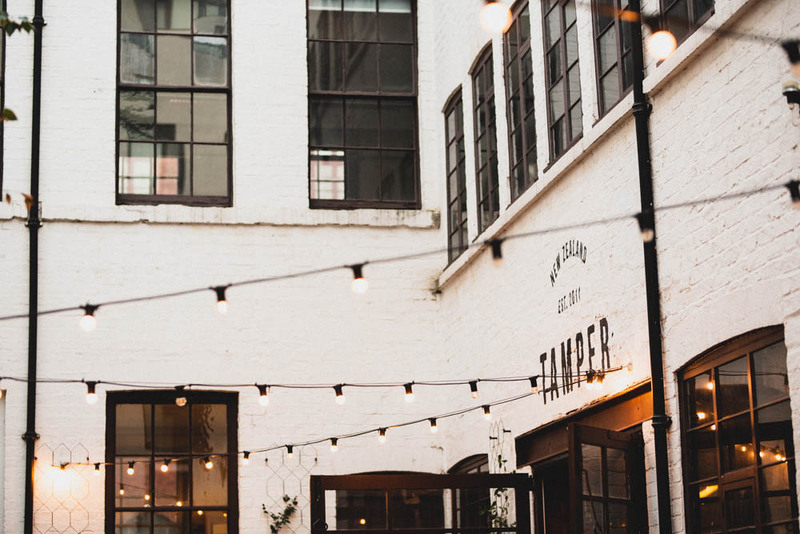 Early in your planning, sit down together and work out what your top priorities are for your day and keep those as your focus. 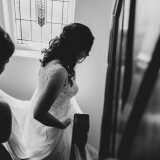 During the planning, I also enjoyed reading Brides Up North’s blog posts of real weddings for ideas and inspiration.